When your child is preparing for their first fall camping trip, one thing’s for sure: an empty stomach in the great outdoors is not an option. “Eating regularly scheduled meals can help kids stay energetic during outdoor activities such as hiking and biking,” says Jenn Koffs, RD, CNSC, CSO, LDN from the Department of Clinical Nutrition at St. Christopher’s Hospital for Children. She says because glycogen stores can become depleted after just 30 minutes of vigorous activity, it’s important to pack snacks that contain complex carbohydrates so that your child can refuel between meals. Additionally, you need to make sure your child stays hydrated. A good rule of thumb is to make have them drinking at least 8 ounces of water for every 20 minutes of exercise. As for meal time, skip the store bought, pre-packaged dinners. A family outing should include meals that are easy, healthy and fun to prepare together. 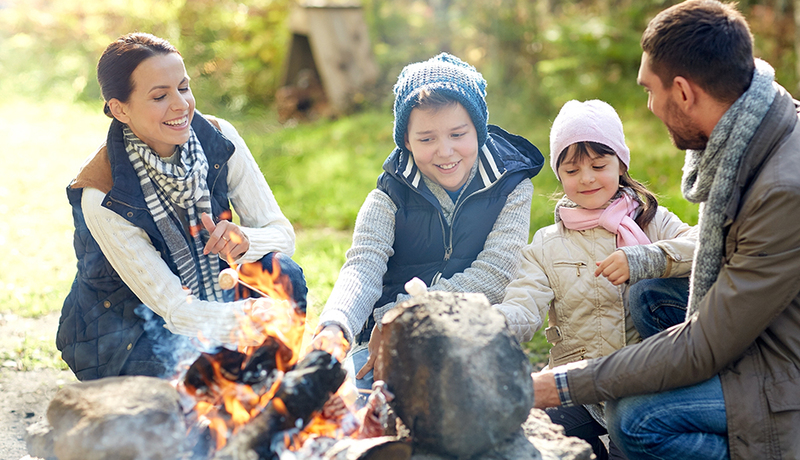 Continue reading for some mouth-watering campfire recipes and healthy grab-and-go snacks. Arguably the most important meal of the day, preparing a morning meal rich in complex carbohydrates and protein will help your child stay energized throughout the day — whatever you have planned. These breakfast ideas are nutritious and easy to prepare outdoors. Overnight oats: Mix dry oats with milk (or a milk substitute like soy, almond or coconut) and chill overnight. In the morning, top your oats with fresh berries, apples or bananas. Chopped nuts, coconut flakes, peanut butter, almond butter or cinnamon are also great additions to sprinkle on top. Ham, cheese and bread bowl: Scoop out the inside of a whole wheat dinner roll and line with a slice of nitrate-free ham. Sprinkle in some shredded mozzarella and crack an egg into the open space. Cover it with foil and cook it on the edge of the fire near hot coals until the egg has set. Garnish with sliced avocado and tomato. Apple crisp: Roast rolled oats, coconut oil, chopped nuts, cinnamon, salt, apples and maple syrup in a cast iron skillet over the fire. It might taste like dessert, but it’s nutritious enough to start the day off right. After a fun morning hike or a long swim in the lake, it is time to refuel. Keep your hungry campers happy and energized for the rest of the day with campfire versions of their favorite mid-day meals. Quesadillas: Top a tortilla with everyone’s favorite veggies, protein and shredded Mexican cheese. Place the tortilla on a piece of folded aluminum foil and lay it on a grilling grate over the campfire until the cheese has melted. Hearty PB and “J” Sandwich: Toast two slices of whole grain bread over the campfire and spread with peanut butter (or any nut butter of your choice). In lieu of jelly, pile on strawberry and banana slices for a yummy twist on this lunch time classic. Grilled pizza: Place English muffins or a flour tortilla sprinkled with tomato sauce, cheese and veggies on a piece of aluminum foil over the grill or the campfire, then cook until cheese is has melted. Serve hot. It’s been a long day. Eating dinner as a family while you watch the sun set around a campfire will be one of those memories you’ll hold onto forever. Try these delicious and simple recipes your kids will love. Lemon Chicken and Potatoes: Roast chicken breast and baby red potatoes dressed with olive oil, Dijon mustard, whole grain mustard, thyme, dried rosemary, kosher salt, lemon zest, black pepper, and sliced lemons in a foil packet over the campfire until the chicken and potatoes are cooked through. Pizza Nachos: Place a cast iron skillet over the fire to roast tortilla chips drizzled with marinara sauce, parmesan cheese, diced onions and bell peppers, sliced mushrooms, minced garlic, red pepper flakes, and mozzarella cheese. Grilled Caprese Sandwich: Butter two thick slices of rustic Italian bread for each sandwich. Place the bread slices with the buttered side down in a cast iron skillet. Top with sliced mozzarella cheese, tomato slices and fresh basil. Place the second piece of buttered bread on top with the buttered side up. Grill until the bottom has browned. Flip the sandwich over and cook the other side until browned and the mozzarella cheese has melted. Bon appetit! In case your campers are still hungry, we’ve got you covered with a couple extra snack ideas to keep everyone satisfied all day long. While you can never go wrong with items like whole grain crackers with cheese, sliced veggies with hummus, trail mix or popcorn, these quick and easy recipes will be delicious and fun to make. Blueberry Poppers can easily be pre-made at home. Dip blueberries in vanilla yogurt and place on a baking sheet that has been lined with waxed paper or parchment paper. Sprinkle with shredded coconut or lemon zest then freeze for an hour and keep chilled until you’re ready to eat. The Banana in a Blanket is also a pretty effortless treat. Just spread sunflower butter on the inside of a whole wheat hot dog bun. Peel a banana, fit it in and add additional topics as desired.